April Showers bring May Flowers.... or so they say. So for my block in April, what could be more fitting than umbrellas for the April Showers? 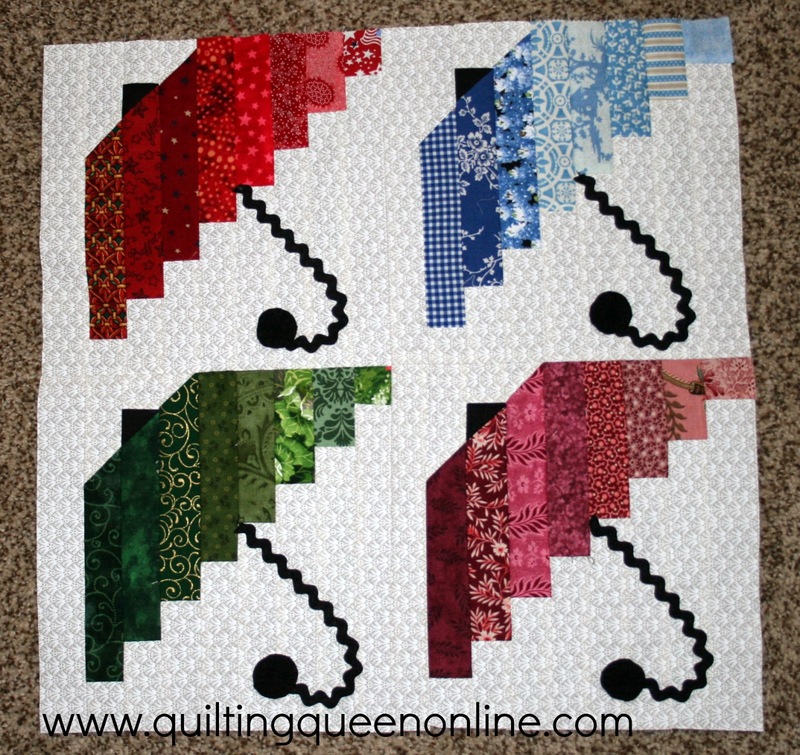 I saw this quilt pinned on Pinterest and I thought the block needed to be in the the Seasonal Mystery Quilt. There are 4 blocks in this unit and these blocks will finish 9" (9 1/2" unfinished). You will need to make 4 of these blocks. 1. Begin by drawing a diagonal line across the black 1 1/2" square and one of the background 1 1/2" squares and one of the 3 1/2" rectangles. I used this marking pen from Fons and Porter. I really like it because it draws a nice fine line and you can purchase various colors of "lead" for it. 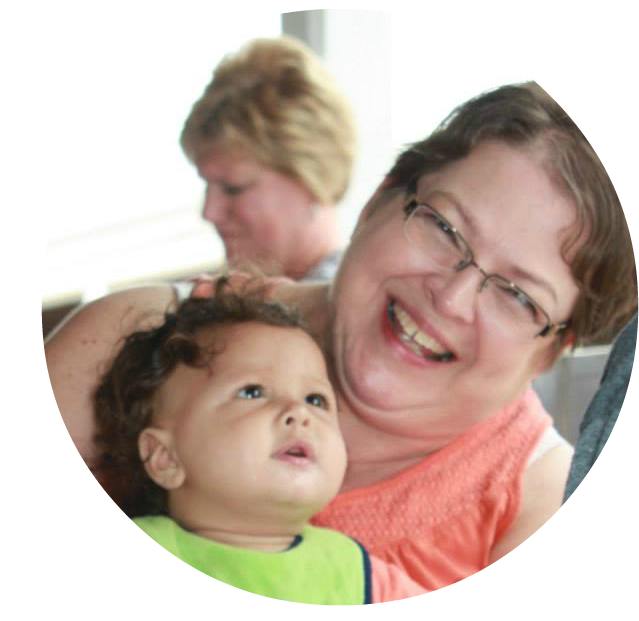 Watch the placement of the diagonal line on the 3 1/2" rectangle. To draw the line on the 3 1/2" rectangle I lined the rectangle up with the grid of my cutting mat and lined the ruler up on the diagonal. By doing this, you will notice the placement of the diagonal line is in the place it needs to be. 2. 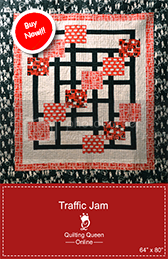 Lay one of the background 1 1/2" squares on a 6 1/2" color rectangle and sew on the diagonal line. Watch the placement of the diagonal line! It will need to go from upper right to lower left like this. 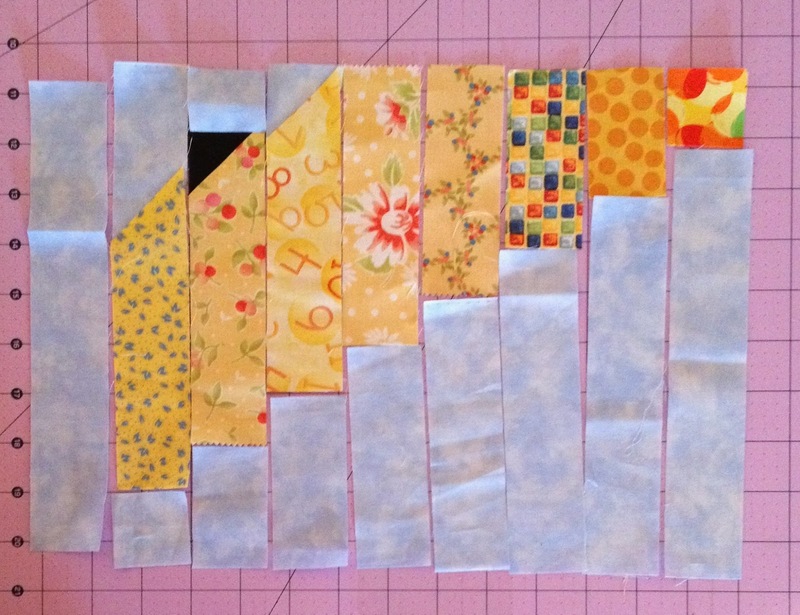 Repeat this for the 1 1/2" black square on a 6 1/2" color strip, sewing on the diagonal line. 3. 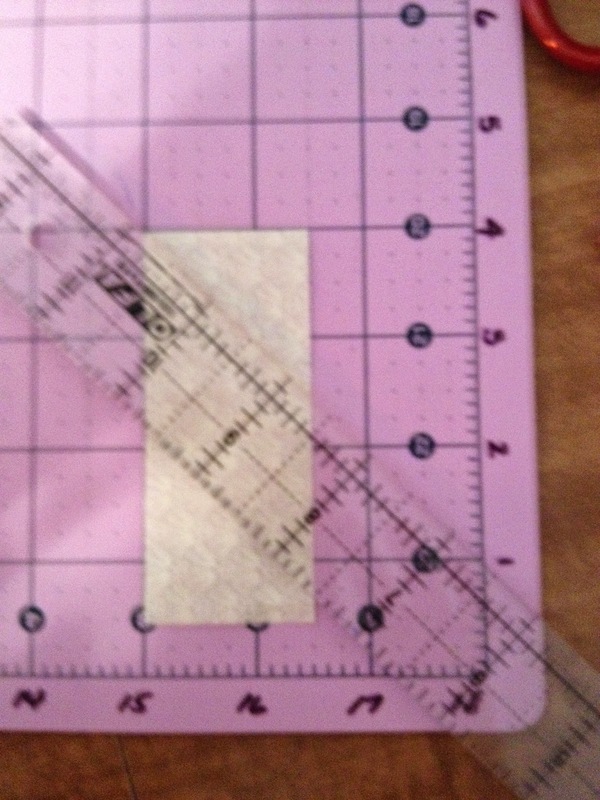 Lay the 3 1/2" background rectangle at a right angle on a 6 1/2" color rectangle and sew on the diagonal line. Again, watch the placement of the diagonal line. Trim off the excess and press toward the strip. 4. 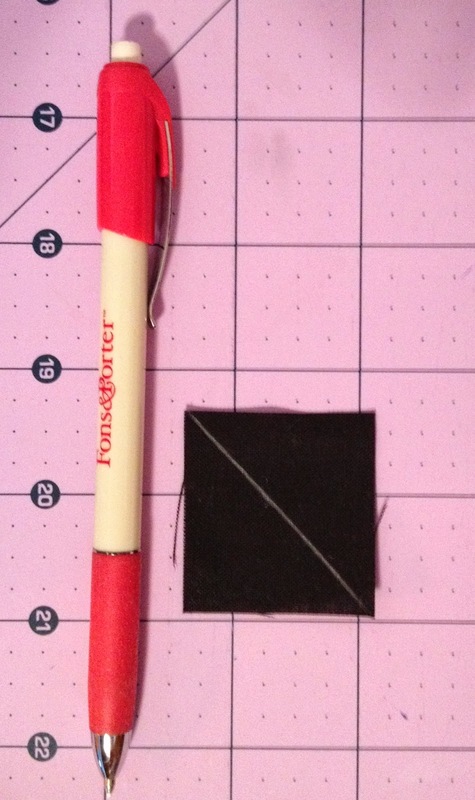 Sew a 1 1/2" background square to the black half square triangle unit made in step 3 as pictured below. 5. Sew a 1 1 /2" background square to the 3 1/2" half square unit made above sewing it the the bottom end of the unit as pictured below. 6. 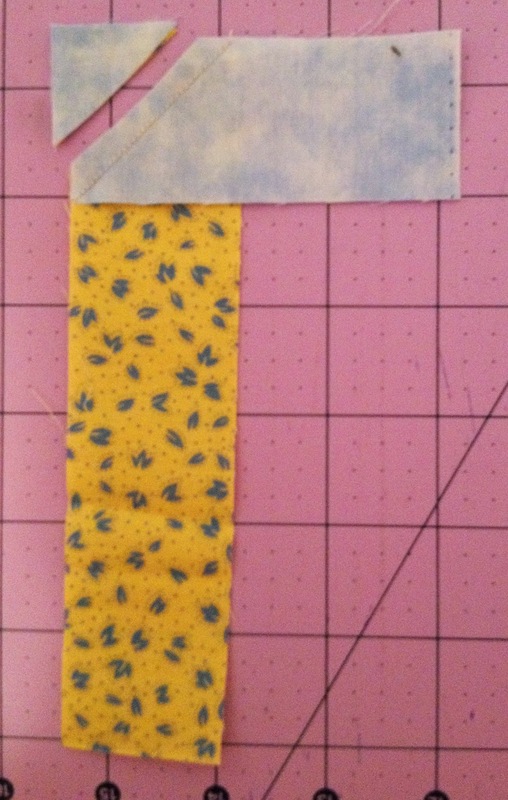 Sew a 2 1/2" background rectangle to the bottom of the unit made in step 4 as pictured below. 7. Sew a 3 1/2" background rectangle to the 1 1/2" background half square triangle unit made in step 2, sewing it to the bottom end of the unit as pictured below. 8. 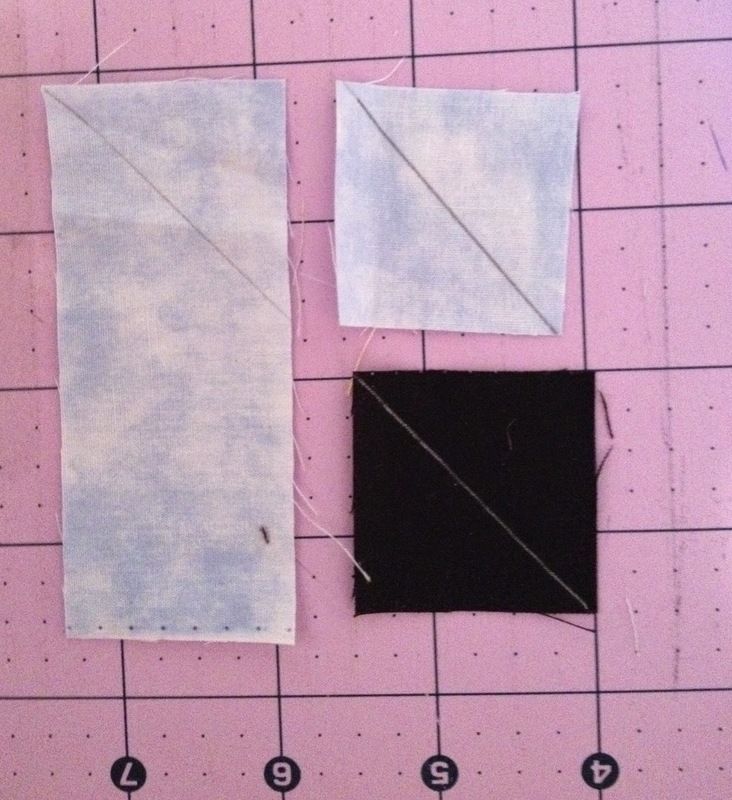 Sew a 4 1/2" background rectangle to a 5 1/2" color rectangle. 9. 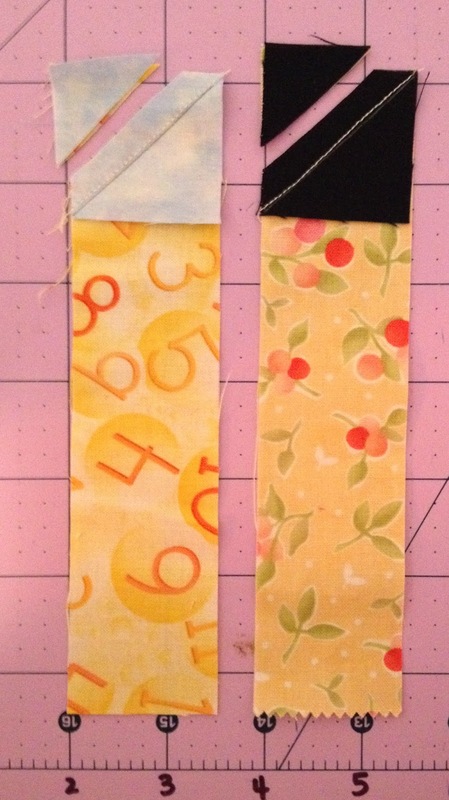 Sew a 5 1/2" background rectangle to a 4 1/2" color rectangle. 10. Sew a 6 1/2" background rectangle to a 3 1/2" color rectangle. 11. 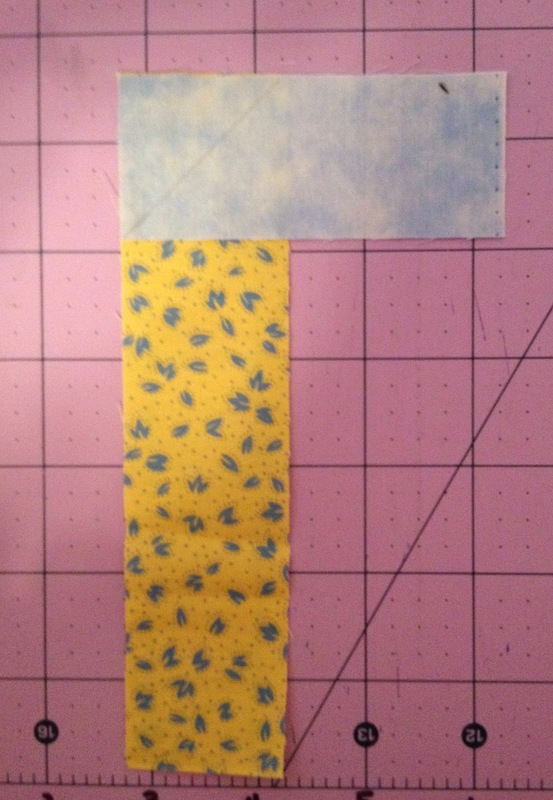 Sew a 7 1/2" background rectangle to a 2 1/2" color rectangle. 12. Sew a 8 1/2" background rectangle to a 1 1/2" color rectangle. 13. Lay the block out as pictured in the diagram below. 14. 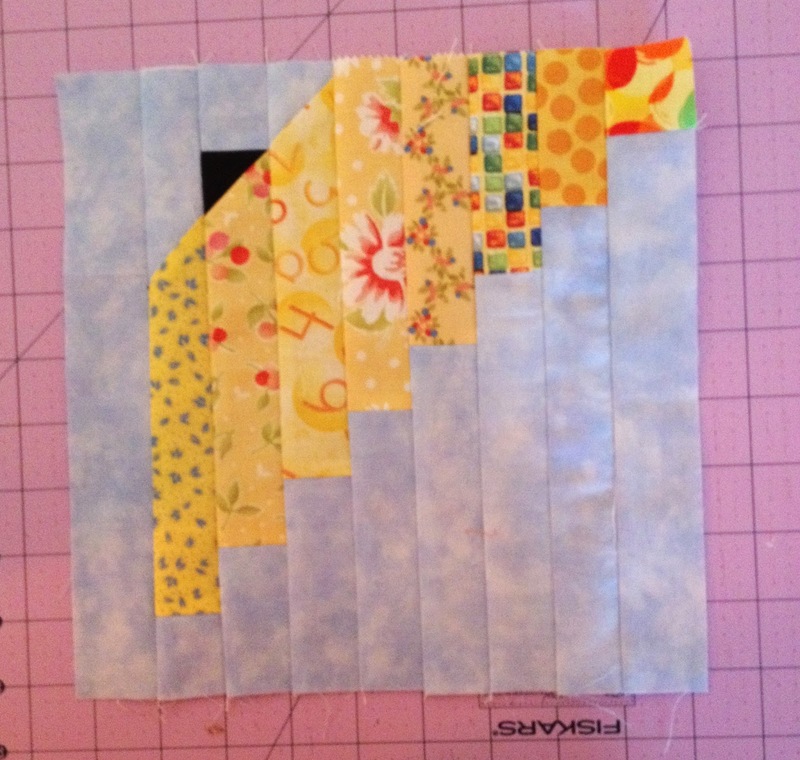 Sew the strip units together to make the block. It should measure 9 1/2" square. 15. Repeat the above steps for the other 3 colors. 16. Sew the 4 blocks together to make the 18 1/2" unit. 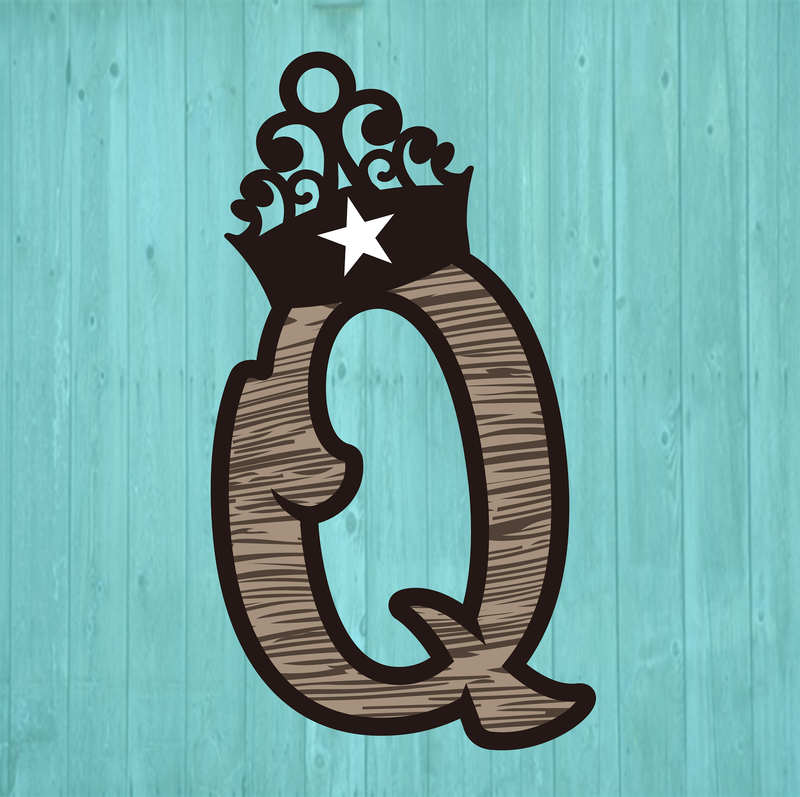 Here is another color way using a cream colored background. I used black ric rac for the umbrella handles and just pinned it on free hand and sewed down the middle of the ric rac to secure it to the block. I added yo-yo's to the handles in one of the block units and I used coordinating buttons in the other block unit. My yo-yo's nor my buttons are sewn down yet. 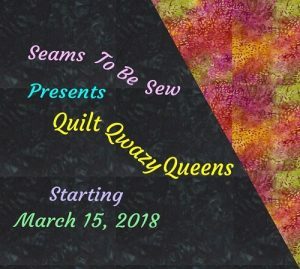 I will add them after the quilting is complete. I don't want to have to fight the machine with the buttons or the yo-yo's. Wouldn't this look cute to use colored ric rac for the handles in place of the black? 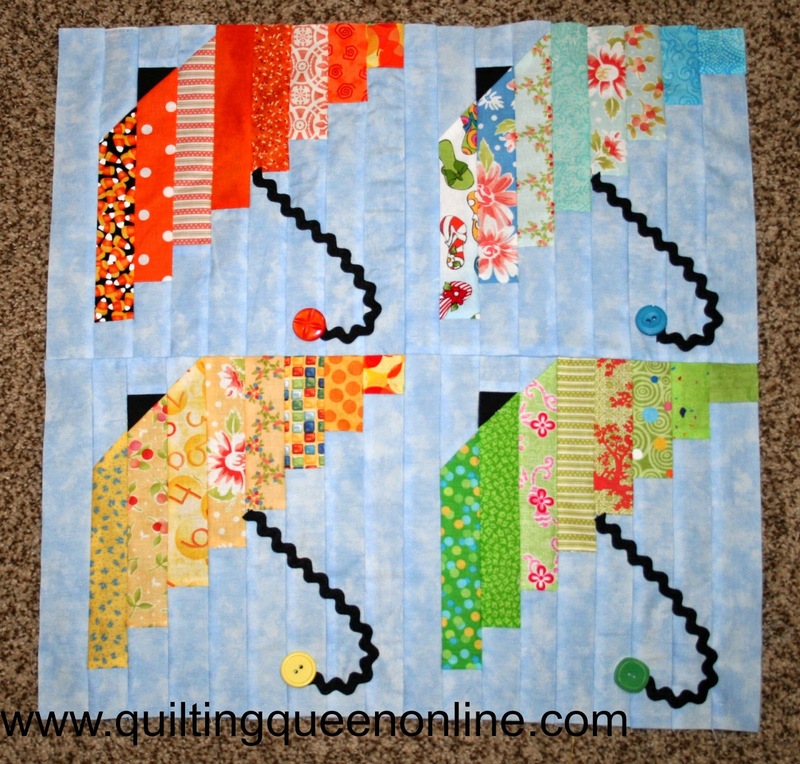 And to use a dark colored coordinating half square triangle on the top of the umbrella instead of the black? Are you keeping up with each month on the Seasonal Sampler? Be sure and link up so we can all see your progress, whatever it is. 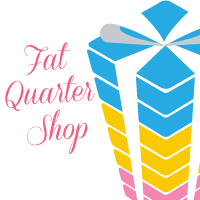 I haven't been following with your sampler but I think this is the cutest block. I'm going to go back and see what the other blocks are. Thank you.